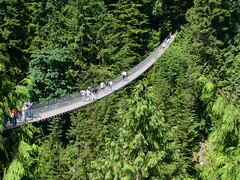 Our final day in Vancouver before we head off to Whistler so we decided to head off to the Capilano Suspension Bridge. To get there we took the Seabus (ferry) to North Vancouver and then a bus up to the bridge. The Bridge was built after a settler discovered a huge gorge running through his land and no way to cross. He then sold the bridge to an aspiring scot who charged city slickers 10c to walk across the bridge. This started a craze that continues today – however inflation means you pay $20 to cross the bridge now. On the site there is also a historic tour telling the tale of the bridge (lots of romance involved but I wont bore you with the details) and on the other side of the gorge is a series of boardwalks through the forest and a treetop walk. Walking across the brigde was a bit of a worry as it tends to swing and shake as about a hundred tourists clomp along. Once you get used to the swaying though the walk is quite something. I’m not sure of the exact dimensions, I’m sure Simon can fill you in, but I did note that if the Statue of Liberty were standing next to the bridge it would come up to her shoulder and it is so long that two 747’s could fly wing to wing under it. I really enjoyed the tree top walk. This was 7 bridges linked to platforms positioned halfway up Douglas Firs in the forest. When we stood on one of the platforms and looked up, the tree was so tall that you felt you were standing on the ground and not halfway up the tree. Simon has a photo that gives you a bit on an idea of just how tall the trees are, one though was about 200ft tall. Simon and I can understand why this has been a tourist attraction for over 200 years, very pleasent day out and a bit of a thrill as well. Great to hear from you and good to hear that our nephew is keeping you busy. At least someone is keeping the comments coming!